The juggernaut that is the 'Vth Analogue Hobbies Painting Challenge' continues apace and although yours truly has yet to submit an entry in the competition proper, I have managed maintain some level of credible presence in the bonus themed rounds, the second of which, 'Riders & Mounts' was due on December 28th; with voting still open for a couple more hours you still have time to show your appreciation of your favourites - click here to cast your vote! 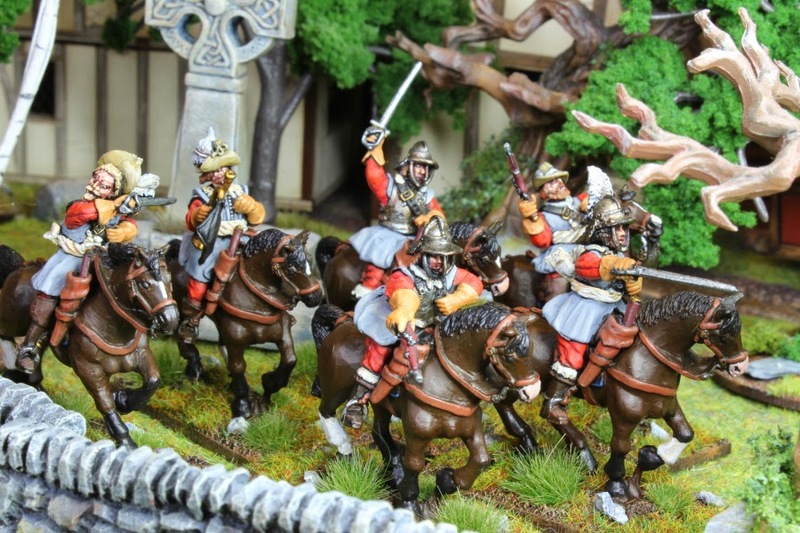 Having made the decision not to purchase any additional miniatures for the challenge, this round afforded me the opportunity to get to grips with a group of 'Redoubt Enterprises' English Civil War Cavalrymen that I had earmarked for my 'Witchfinder General' project. 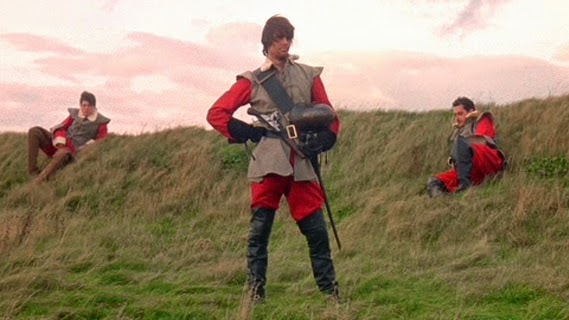 Although a myriad of possibilities presented themselves, with regards to uniform colours, I found it difficult to dislodge the striking red attire or Ian Ogilvy's character, Richard Marshall and his troop of Roundheads in the Witchfinder General film of 1968. Of course the wonderful thing about this project is that although based in a historical period it is, of course, totally fictitious allowing me to mix and match units, troops and in this case sides with both Roundhead and Cavalier heads on show. This was also a wonderful opportunity to fire up my new shiny airbrush, with the bases and horseflesh taking no time at all. This is a great boon to me as it is exactly these areas that I least enjoy. I will often sit and procrastinate, something I excel at, instead of just wading in and getting them done, but no more! Now with the flick of a switch they are all but done and I'm looking forward to trying some blending techniques later on in the challenge. 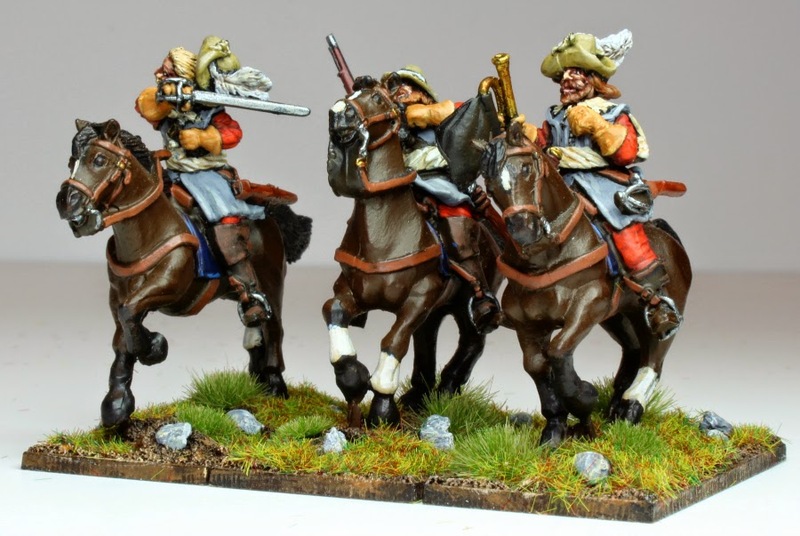 Having done a such basic job with the mounts and saddlery, it seemed only fair to lavish a bit more attention on the riders themselves with the splendid Redoubt sculpts affording plenty of opportunities to pick out details. Yes the sculpts are perhaps a little basic by today's standards, but as a result they are easier to clean up and ultimately more rewarding to bring to life. There have a definite quality to them and are so reassuringly weighty. Hopefully these six 28mm English Civil War Cavalrymen and their mounts will earn me some much needed points towards my seemingly unassailable tally, kickstarting the New Year drive towards the finish line. And a very nice bunch of horsemen (and horses) they are too sir! Thank you so much Tamsin. Lovely stuff Sir M, that little machine sure is gonna save you a lot of time!! Thank you Ray, it is certainly great fun! Very nice Michael. I do like the mix and match approach to the unit. Is the compressor an Iwata? I only have the basic Iwata compressor which does the job but have been considering upgrading to a large machine plus maybe another airbrush for detailed work. What model is the compressor and how do you find it for noise pollution? Thank you Mark. The airbrush is an Iwata, but the compressor is a Simair AC100 Airbrush Compressor. I found it on Amazon for a ridiculously reduced price and it seems to do the job rather well. I'm not sure about noise pollution as I've not used one before. I will say that is not unbearable, but perhaps not the quietest out there. Thanks Michael, I'll have a look at their compressors. It sounds very similar to my Iwata for noise. They do look fabulous. I may have to get my witchfinder project past flipping through the rules and forgetting about it! Perhaps this might help to spur me on. Thank you Clint and I'd love to see what you'd do with the project. Thank you so much kind Sir. It really is a striking uniform and you've done a great job with them and their horses. Looking forward to seeing what else you do with the airbrush this year! Thank you Brian, I tried a little bit of blending the other day, which was great fun, but lots to learn. I don't have much experience with Redoubt, I got a few but they turned out to be much bigger than anything else I had so didn't get more. That's also a wonderful piece of steampunk machinery you've got. Enjoy! No one in my house would dare trust me at the controls of such a beast. Thank you Peter and you are quiet right regarding the scale of the Redoubt miniatures - they are certainly on the large side. That said they have a certain charm and always seem to paint up well. Very nice modeling, sir. Congrats on the acquisition of the new airbrush. Thank you Jay, it is certainly a wonderfully shiny thing! Excellent job and interesting system! Very well balanced and attractive color scheme, and what better way to unite the royalist and parliamentarians cavalry than in a fresh little witch-hunting! Thank you and it was certainly great fun mixing up the unit. I have a similar project in mind. Inspiring blog. Thank you John, looking forward to seeing what you have up your sleeve. You've got the technique with that airbrush down very quickly. Nice entry! Thank you Anne, I'm enjoying learning lots of new techniques. Superb stuff ... and I love the colour scheme! I wish I had me an air brush too, yours look really nice and shiny. :) Oh yes ... Happy New Year! Thank you and it is most certainly nice and shiny, now I just need to learn how to use it! Very nicely done Michael and Happy New Year! Thank you Simon and a Happy New Year to you too! Thank you Dave, the airbrush is going to prove a wonderful distraction - lots to learn first. What a fine company of horsemen. Beautiful work! Wonderful work on these chaps Michael! Thank you so much Rodger. I can see I will have to learn the finer points of airbrushing, this is splendid work Michael! Thank you Evan, it certainly helps to get me started with larger units, I suppose coloured primers do the same thing, but I've always fancied an airbrush. "a definite quality to them and are so reassuringly weighty." Two things that are often missing from modern minis IMHO. Top work as always Mr A and one of my favourite periods to boot. Keep em coming! Thank you kind Sir, there are certainly a couple more in this period to come, just need to get the bonus rounds covered first. Great work there. They look really good! Lovely bunch of horsemen Michael. That airbrush system looks fantastic too. Thank you Bob, the system is more than I need, but it just looks so lovely I couldn't resist! Great figures and a great movie. Happy new year! Thank you Dean and a Happy New Year to you too. Nicely done Michael, was the airbrush a Christmas present? 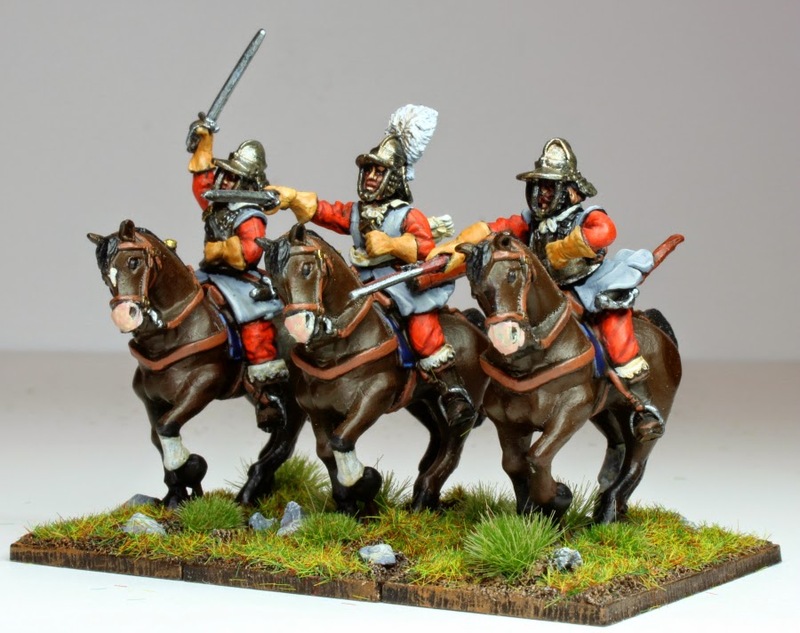 I will expect to see many more mounted troops then I take it! Thank you Terry, a birthday present from the wonderfully generous Mrs. Awdry and I've been tinkering with a couple more effects only recently. Lovely airbrush work and top quality Tygon referencing! Thank you Herbert, but Tygon referencing? What have I missed? Thank you Pete and great news about Renegade Miniatures as I had missed that. Some very nice work on these chaps! Looks like you've really made best use of that airbrush. Mine is more or less collecting dust as I HATE cleaning that f****ng thing only to discover it's not working properly when trying to use it the next time. Thank you and I have to confess that it does take me longer to clean it than use it, but that's me all over - always looking for the next distraction.